One of the key functions that Microsoft left out of Microsoft Excel is one that returns values to the number of significant digits that you wish to use. 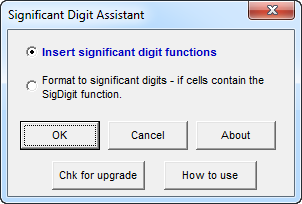 The Significant Digit Assistant add-in adds this function to Microsoft Excel! It also contains features that help you add this function to many cells very easily. Rule 1: If the digit to be dropped is less than 5, drop that digit and all other to the right of that digit. Rule 2: If the digit to be dropped is greater than or equal to 5, increase the value of the last digit retained by one. Please note that although all calculations for rounding are done using double precision, calculations are digital and subject to the values being supplied to the significant digit function and calculated by it to suffer from digital impression. For example a value that you see in a cell may be visually 0.5. There is a slight chance that Excel may be carrying this value as 0.500000000001 or 0.4999999999. In which case when the Significant Digit Assistant treats this a number not equal to 0.5 and follows rules 1 and 2 for rounding.